"Drum-Machines, the 2nd recording made and produced under the label Percussions de Strasbourg, marks an important turning point in our approach, that of the 4th generation of our ensemble. At the junction between contemporary and electronic music, Drum-Machines was created following a process of dynamic composition: the performers first proposed sound materials on two research residencies and then eRikm ensured the composition, the music production and mixing. Commissioned by Percussions de Strasbourg and GMEM, Drum-Machines was created on October 7 th, 2016 at Musica Festival in Strasbourg. «Les Percussions de Strasbourg perform augmented sound material that showcases the intuitive and sensitive universe of eRikm. Between rustling electric razors, the tingling of metal, swirling marbles and ballets danced by twigs, the performers caress, rub, react, transform, develop multiple modes of play and offer a fresh, delicate and unexpected exploration of sound. 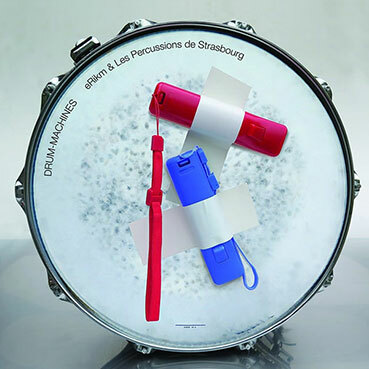 In a truly collective effort, both in terms of the making of materials and the design of the form and the execution of this unique piece of work, Les Percussions de Strasbourg have fully enjoyed their collaboration with one of the most recognized producers of electronic music of our time. «Throughout the ages and their various uses, survival tools (rhombus wind instruments, flute-calls, etc.) have become musical instruments. In the context of this work, these vectors of affects co-exist side-by-side with an electro-acoustic system. This machine cannibalizes its own sound production while simultaneously thriving on sounds produced by the musicians. From this agora spring forth “multitimbral” landscapes whose edges dissolve into microtonal steppes, devoid of human action. From liminal pulsation to decimal infinity, the physicality of the sound summons an allegory to geology, from the infra thin (l’émoi – volute) to the supra massive (embâcle – doline). Drum-Machines consists of subconscious and collective archaic fields that reach all the way to the noise aberration of the contemporary world. The 21 st century begins in its great collapse, the imbalances and the disruptions of the sound masses deployed by (percussionist) organisms in movement compress time and sounds until their paroxysms. This work is the elaboration of a lengthy sifting approach in which process creates form through a dynamic composition. This process uses accumulation, manipulation and re-arrangement across several generations of sound data. Speed, pulse, timbre and instruments are subject to numerous distortions by real or virtual machines. The original intention is modified and transformed.